Curtiss Vachon is currently one of the highest active scorers in Massachusetts lacrosse, but Vachon's historic career has gone unnoticed by many across the Commonwealth. 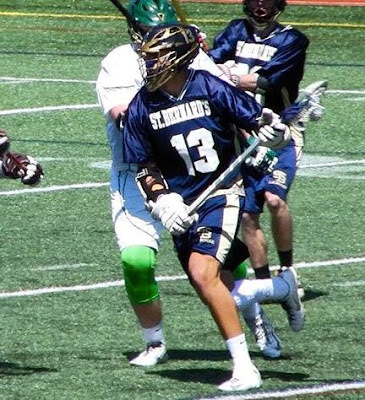 The senior from St. Bernard’s in Fitchburg is one of the most dangerous attackmen in the state, and is a feared presence from the moment he steps on the field. The 6’4”, 220 lb. lefty is a rare sight as an attackman, not to mention a nightmare for opposing teams and defenses. “Well I’m one of the bigger kids on the field, and it's strange in high school for there to be such a big attackman," Vachon said. "I’m kind of weird to play defense against, especially being lefty pole." St. Bernard’s Coach Michael Kelley has been blessed with an amazing talent and knows Vachon’s strengths better than anyone. The preparation and understanding of the game makes Vachon more than just a physical threat, says Kelley. Vachon entered his senior year with 303 points, along with only two other active players in the state with over 300 points. He’s off to a hot start with 400 in sight. 13 games into the 2016 season, Vachon has already tallied 34 goals and 30 assists for 64 points, bringing his rolling total to 367. If his current average of five points per game this season holds for the final seven games, Vachon will become just the 15th player in Massachusetts history to reach 400 career points, and join Grafton's Tyler Reilly and Bryan Rotatori, along with Algonquin's Brian Cooke, as the only Central Mass players to do so. St. Bernard’s is off to a hot start with Vachon leading the way. The Bernardians have now qualified for the state tournament at 10-3, and have outscored their opponents 170-93 thus far. “He's always looking for ways to make the team success better, despite whether that affects his stats or not," Kelley said. "Especially this year, when more and more teams key in on him." Nashoba goalie Robby Atwood, a good friend of Vachon and a future college player at Ithaca, has first-hand experience facing Vachon. Atwood knows all too well the difficulties opponents have stopping him. Despite being largely unknown outside of Central Massachusetts, Vachon has proven capable of taking his game to the next level. The senior plans to extend his career into college, committing to play Division 1 lacrosse at Wagner College. Although coming from a small high school, Vachon has shown off his talents at showcases, drawing attention from many schools. Vachon was offered by Wagner in February of 2015, but was also sought after by Bentley, Tufts, and Sacred Heart, among others. If Wagner had not landed Vachon, they may have been on the wrong side of his play making. Wagner rival Sacred Heart had a great deal of interest in Vachon as well. And as his second favorite school in mind, it was a tough decision. But, in the end, Wagner edged out the rest of the competition. Coach Kelley is very proud of his young star, who he has seen grow right in front of his eyes. Their relationship dates back to when Curtiss started playing lacrosse in second grade, all the way up to high school. As a freshman at St. Bernard’s, Vachon posted 47 points with 37 goals and 10 assists. The following year as a Sophomore, he broke out and netted 77 goals and 26 assists for 109 points. “Freshman and sophomore year I was really more of a set shooter, I couldn’t really create for myself," Vachon said. "But having a ball in my stick so much junior year really developed me and I’m more of a dodger now." In his junior season he led Central Mass in points and goals scored with 105 goals, and 42 assists for 147 points. Although the numbers are mind boggling, Vachon remains humble, giving credit where it is due. He is thankful for all the people who have supported him along the way. “The things I've valued most in high school have been having really good role models on the team, and having a great coaching staff that have all developed me as a person, and developed me as a competitor,” Vachon said. Coach Kelley, Atwood, teammates, and others who have seen Vachon play have no doubts that Curtiss will be very successful at the next level. But in the meantime, he's focused on leading St. Bernard's to a deep run in the Division 3 Central/West tournament. St. B's will be back in action Thursday against Leominster, as the Bernardians fight for tournament positioning. Thank you for recognizing this young man! He is a great athlete and a pleasure to watch! Best of luck the rest of the season Curtis and especially next year in college! Very happy for you and your hard work!